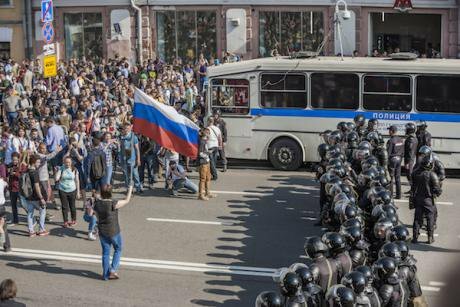 Political repression is ramping up in Russia, but a network of people ready to stand against it is yet to emerge. Riot police surround people during a demonstration against Vladimir Putin in Moscow, on 5 May 2018. Photo: NurPhoto / SIPA USA / PA Images. All rights reserved.2018, a presidential election year in Russia, has become a year of increasing repressions. In February, details of the “Network case” – in which 11 Russian anarchists and anti-fascists are being investigated on charges of creating a terrorist organisation – became public. This organisation never existed, and even its name is a figment of an FSB officer’s imagination. The number of criminal cases for reposting “extremist” memes online is only growing (OVD-Info reported 170 such cases in 2017), and this practice is developing quicker in the provinces than in the big cities. Recently, in the Siberian town of Barnaul, there have been three cases opened against users of social networks. The public campaign in support of people arrested in connection to the “Network case” started well, with several actions in different cities in Russia and across the world. But it has not moved beyond that. It is mainly human rights defenders, leftists and anarchists who are supporting these new political prisoners. Now it is time for a broader campaign against political repressions and fabricated criminal cases in Russia – a campaign that will go beyond individual cases, and that will go beyond solidarity based on personal sympathies towards this or that group of political prisoners. Why do we think that it is time for a large-scale campaign? Russian society’s understanding of repressions is changing, and it is changing visibly. Yes, the word “repressions” still has mainly historical connotations – something from the time of Stalinism, such as executions and deportations. But it is becoming more and more evident: imprisonment for reposting articles on social media, receiving five–seven years in prison for “thought-crimes” – this is the reality in Russia today, and it is not that far away from 10 years of prison camp for telling a joke or criticising the Stalinist bureaucracy. The fact that a group of women from Moscow bohemian circles – actors, journalists, the head of a publishing house and a literary critic – consciously decided to organise an unsanctioned public protest (the “Mothers’ march”) to support two young women arrested in another fabricated case speaks volumes. These people, who were not ready to resist when Russian theatre director Kirill Serebrennikov was arrested, are now saying: “We know everything about how rallies are sanctioned. There is no time for playing games with authorities, we have to go out (and protest)”. 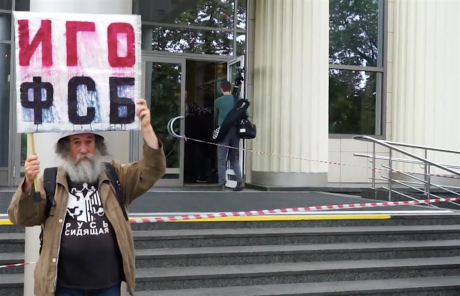 A pro-Serebrennikov protester near Basmanny Court in Moscow. Image: Youtube / Radio Svoboda. Some rights reserved.Our organisation, Socialist Alternative, has waited for this change in consciousness and warned: in moments of political upheaval (and a new cycle of upheaval is clearly on the rise after the announcement of the pension reform and VAT rise), these changes can overshadow the analysis and actions of more permanent political forces and organisations. The other side of this debate is represented by the regime’s media lackeys. For instance, Margarita Simonyan, editor-in-chief of RT, spoke out in her traditional genre of “your protests are evil, and there are normal people who among the cannibals (in power)”. As an organisation, we have witnessed different protest movements in our country. Those of them that tried to distance themselves from politics did not achieve anything, and their participants were eventually demoralised. Only a year ago, we took part in a campaign to free journalist Ali Feruz, who faced deportation to Uzbekistan. Back then, activists also faced pressure – they were asked to stop street protests and were promised that “the case was already being resolved in the offices of power”. This pressure caused certain tensions between participants in the campaign, which is understandable. A threat “to make things worse” is the most vile trick to play on the friends and relatives of someone in prison – and the authorities use it. A column in support of Ali Feruz at the 19 January anti-fascist march in memory of Stanislav Markelov and Anastasia Baburova. Photo CC BY 4.0: Dmitry Horov. Some rights reserved.But immediately when the campaign retreated, the case began to linger. 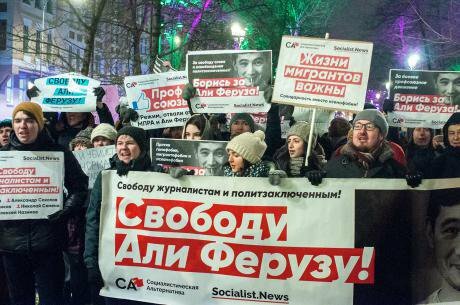 In winter, after months of false promises, the most “radical” part of the campaign led by our organisation renewed public actions and brought a whole column in support of Ali Feruz to the annual anti-fascist march in Moscow on 19 January. Several days later, a court made a decision in favour of Ali. He is free now. 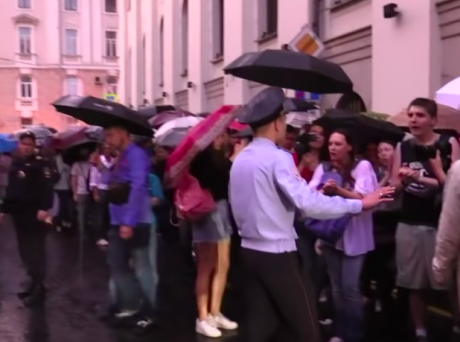 On 15 August, nearly a thousand people joined the “Mothers’ march” as they walked down Moscow’s central Tverskaya Street to the Russian Supreme Court in the rain. Participants carried toys, which they then left at the entrance to the court, where a spontaneous rally began with slogans as “Freedom”, “Freedom for political prisoners”, “We are in charge here”, “Children should not be thrown in prisons”. 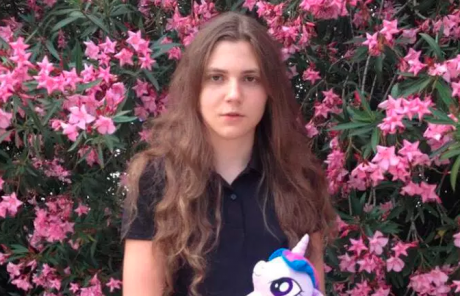 Indeed, Toys became the symbol of the protest after an image of Anna Pavlikova, an 18-year-old facing extremism charges, with a unicorn began to circulate online. Pavlikova is one of those arrested in the fabricated “New Greatness” case – an organisation formed by FSB agents themselves so that they could later successfully uncover “an extremist group”. When she was arrested, Anna was not yet 18; later in pre-trial detention her health deteriorated, but the court refused to place her under house arrest. For many people who joined the action, the umpteenth extension of Anna’s detention at the beginning of August was the last drop – proof of the inhumane nature of Putin’s law enforcement system. 15 August, Mothers' March in Moscow. Source: Youtube / sotavision. This public protest was not sanctioned by the authorities, and the organisers did not buckle under pressure from police who visited some of them at home to “warn them against breaking the law”. The organisers were also not impressed by threats from pro-regime public figures, pro-regime media and even Anna Pavlikova’s lawyer who spoke against the march. Their decisiveness to carry the action out in spite of everything and the fact that more than 5,000 people joined the action’s Facebook group clearly scared the authorities – which are beginning to understand that threats are starting not to work and the situation is not under their control. People are not afraid to join unsanctioned actions anymore, which means that even bigger and angrier anti-government protests are coming. A few hours before the march on 15 August, the Investigative Committee, hoping to decrease the number of protest participants, asked the court to release Anna Pavlikova and Maria Dubovik, another young suspect in the “New Greatness” case, under house arrest. The Prosecutor’s Office supported this move, and the Supreme Court, as it suddenly turned out, compelled the presidium of the Moscow City Court to consider a petition regarding Pavlikova’s arrest previously on 9 August. Such a U-turn in the rhetoric of the repressive apparatuses only encouraged the participants of the march: mass pressure from an action which had not yet taken place was already working. Similar actions, in slightly different format, took place in other cities as well. In St Petersburg, relatives of people arrested in the “Network case” also organised pickets, showing that solidarity is our only weapon against repressions. There is a danger in these protests that we cannot ignore. The emotions of those protesting against the fact that “kids are in prison” are understandable. Their will to fight even more so. But devaluing the political beliefs of Anna Pavlikova, Maria Dubovik and other young people, who are now under pressure from the state, from a presumed “adult” perspective, is unacceptable. This is the other side of regime propaganda. They are trying to persuade us that these young people do not have their own views because they are kids. Young people always feel injustice much more acutely than adults, who are protected by the armour of cynicism and routine. And when those adults swallow all the injustice of Putin’s regime, they are just showing young people how rotten the system is – in which evil is considered good, corrupted officials are called bureaucrats, where the lack of any future is concealed by experts on TV chatting about the country’s bright future, where billions are spent on the commercial show of the FIFA World Cup, while pensions are stolen and real salaries are much lower than propagandists’ feature stories. Anna Pavlikova.Russian young people are getting politicised much quicker and are acting much more radically precisely because they are the conscience of the old world. Young people are put under all sorts of pressures to turn them into safe “experienced adults”. People who already have formed their political beliefs should not help the regime to achieve its goal of breaking the youth – even if their views are different from the views of young people. We should abolish the silly dichotomy of “adult/child”, express our solidarity with young people and fight together against repressions, poverty, discrimination and oppression. In the “New Greatness” case, the FSB agent used the environment prepared by Putin’s policies to his advantage: he simply assembled those who were unhappy about the current situation in Russia and wanted to engage in political struggle. The very possibility of the provocation emerged because of the lack of transparent, genuinely democratic mass political organisations able to challenge the rotten regime openly. These are the organisations that don’t offer “guerrilla”, “partisan struggle”, “revolutionary conspiracy”, “individual terror”, but mass mobilisation in the streets, the organisation of political committees in workplaces and at universities – unified actions in the struggle for higher salaries, pensions, scholarships, and against the commercialisation and destruction of the public system of education and health care. This is the kind of organisation we will have to build if we want to change everything. These shifts that we have described above are still not sufficient for the clear political positioning of a campaign against political repressions in Russia. The organisers of the “Mothers’ march” asked participants not to bring political placards, not to shout slogans and in general to avoid politics. We consider this a weak tactic. If we protest only out of our pity for those arrested in “New Greatness” case, but refuse to demand the immediate end of all political repressions and to understand their political reasons, we will lose. The political reasons for this are as follows: under the conditions of economic crisis, big business cannot afford to share even a fraction of its super-incomes in the form of taxes, while the state budget is not sufficient for carrying out social obligations. The quality of life is decreasing, censorship and violence in suppressing protests are growing. Big business acts as a sponsor of repressions because it is the current regime acting in the interests of business that guarantees the possibility for continuous enrichment by exploiting the cheap labour of ordinary people – and, on top of that, transferring the costs of the economic crisis onto them. In recent years, the general population has become poorer and lost part of its social rights, while the number of billionaires is only growing. Yes, we believe that, in addition to quota system within the security apparatuses, which encourages the enthusiasm of career-driven officers, repressions and censorship are directly connected to Russia’s economic crisis. They are connected to the rise of VAT (an attempt to transfer the costs of the crisis to ordinary employees), with the rise of the retirement age (the refusal of social obligations), with the rescue of private banks such as Otkrytie (instead of ordinary people affected by the crisis, for example, the holders of mortgages borrowed in foreign currency), with the rising petrol prices (a carte-blanche for the oil industry and again a transfer of crisis-caused losses to ordinary people). These are all links of the same chain: the regime that protects the interests of big business has prepared its police forces waiting for the wave of protests from below – a wave that is inevitable in the absence of any perspectives for the growth of the quality of life. These police forces are already unleashed on some people – usually those who have no one to protect them. Most probably, this is a rehearsal of much crueler repressions in the light of the upcoming pension reform protests, which have not yet attained their full force. We believe that it is time to start a campaign against political repressions and fabricated criminal cases. A general campaign that will not focus on individuals only. We call upon leftist political and human rights organisations to set up a round table and an organising committee for such a campaign. We call for a permanent campaign with regular mass actions and the dissemination of information in the media. Such a campaign already has natural allies: the journalists of MediaZona and the experts of OVD-Info have already created the infrastructure of quick reporting on new crazy political processes. The task of the campaign is to react, to create a stable network of supporters in different cities, to come to courts and rally in front of them, to organise actions at each turn of every important case, to organise stickers and leaflets at the local level. The campaign must also demand the abolition of Articles 148 and 282 of Russia’s Criminal Code. A person of any political beliefs if s/he is against repressions and censorship (and does not support repressions against political opponents – as the right often does) can join this campaign. Calling for such a campaign, Socialist Alternative is nonetheless convinced that repressions will not stop under a capitalist state – they can only temporarily recede, since they are in the interests of the state. To end repressions, it is necessary to destroy their source: large-scale capital that sponsors them. It is necessary to socialise, under democratic control, the country’s largest economic sectors: oil and gas production, utilities, construction industry and so on. This will allow us to guarantee decent life for everyone and take power from the 1% who control everything now – big business and oligarchs who advance their interests, using millions created by our labour. On their own, young people, students, people living from paycheck to paycheck will not be able to achieve this goal without their own party, independent from business and bureaucrats. Only if they are organised will they be able to fight for the democratic and socialist transformation of Russia and the whole world, which will end repression and exploitation.